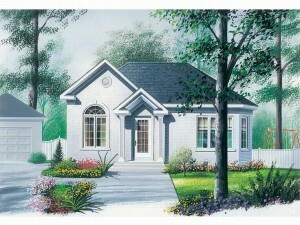 For those who don’t require a lot of living space, cottage house plans are a good choice. Though they don’t offer everything you might find in a family-sized home, and they will never compare to a mansion, cottage floor plans are designed to be comfortable and accommodating. Small in nature, cottage home plans are well suited as a primary residence for a single person or a couple and provide all the comforts of home without all the fussy extras. Furthermore, they make great vacation homes and are even a nice selection for a mother-in-law suite or guest house on a large estate. 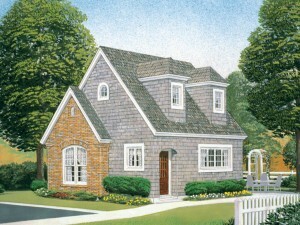 Cottage house plans are sometimes referred to as English cottages. They are quaint, but deliver plenty of outward charm. Though the floor plan is usually simple in design, cottages usually enjoy decorative exterior details and trim such as a railed porch, window shutters and flower boxes. Their interiors are neatly decorated as well. These small houses typically provide basic accommodations including one or two bedrooms and baths, an open floor plan with combined living and dining areas, a modest kitchen and occasionally, a space for a stacked washer and dryer unit. Cottage designs blend nicely in a variety of settings from the side of a peaceful country road to a cozy and peaceful neighborhood. The House Plan Shop’s cottage collection features floor plans that offer no more than 1200 square feet of living space and do not include a garage. 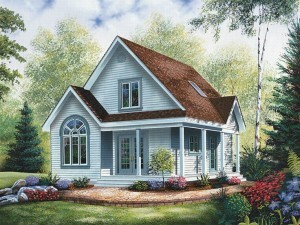 Because of their small nature, cottage home plans are closely related to cabin floor plans. Known for their charming designs and cozy accommodations, cottage house plans deliver comfortable and relaxed living year-round or just on long weekends.